The Reffye Mitrailleuse (canon à balles) was a hand-operated machine gun that fired volleys of bullets from 25 parallel rifle barrels built into a brass cannon sleeve. It was developed by Jean-Baptiste Verchère de Reffye from 1865 to 1867, and owed much to earlier designs by Captain Fafschamps (1851) and Christophe and Montigny (1863). The gun was used during the Franco-Prussian war 1870 - 1872 with limited success and was the first mechanically loaded and fired 'machine' gun fielded and used as part of a national armoury. There are excellent articles on the history and use of the Mitrailleuse available on the web, so this article concentrates on demonstrating how the gun operated. The Reffye Mitrailleuse was a 'super weapon' fielded by the French Army when war was forced on them by the Prussians in 1870. The operational use of the Mitrailleuse is covered by Dr Patrick Marder's article on the Mitrailleuse, and also in Wikipedia. By 1871, a number of guns had been captured by the Prussians, and a report entitled "Die französische Mitraileuse. Zum ersten Male volständig in allen ihren einzelnen Theilen bescrieben und dargestellt" was published in 1871 by 'von G.von P'. This report was translated from the German into English by Lieutenant Commander W.M. Folger U.S.N and published by the United States Government Printing Office in 1873 as "The French Mitrailleuse: Full and Complete Description of the Construction, Service etc.". Folger's translation of von G. von P's report provides an excellent description of the operation of this gun, and I have reproduced it below, with some in-line comments where necessary. The illustrations in Folger's translation are identical to von G. von P's work, apart from the labels, which have been translated to English. In this article I have mixed images from my model with original drawings to illustrate the mechanisms. Bear in mind that the report was written by a Prussian in the middle of a war between France and Prussia, and readers may notice a bias against France in the introduction. Note also that I believe von P. von G made a number of small descriptive errors, in the details of how the actual gun worked, and these descriptive errors have been (naturally) been carried forward into Folger's translation. 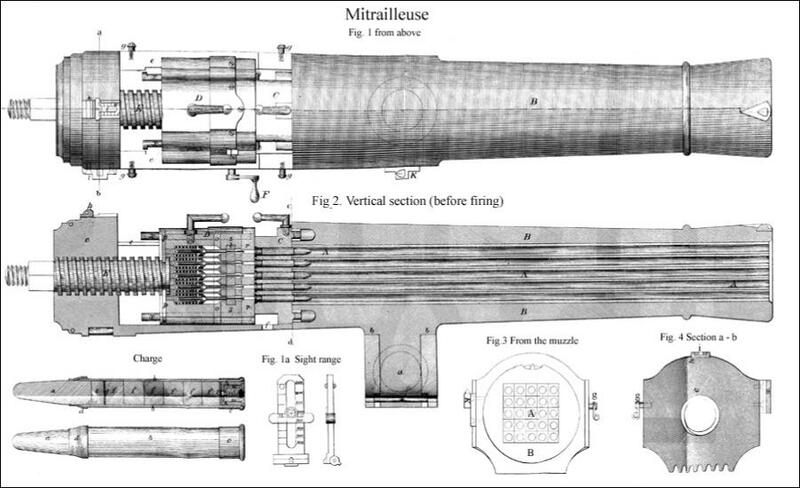 The French Mitrailleuse: Full and Complete Description of the Construction, Service etc. The surprising successes of the Prussian armies over the Austrian in the year 1866 were due, aside from their excellent strategic disposition, principally to the fact of the former being armed with the needle-gun. The attention of all Europe was drawn to this weapon, and a general move was made either to alter the old muzzle-loader into a breech-loader or to discard it altogether for a new model. 1. Those in which the barrels are movable, and capable of delivering an unbroken, continuous fire. 2. Those in which the barrels are fixed, and the fire delivered in volleys with longer or shorter pauses. To the first system belongs the so-called Gatling-gun. To the last, Christoph's and Montigny's [Folger names him as Montejay] mitrailleur, and also the Feldle gun, lately proposed for introduction into the Bavarian army. The French mitrailleuse belongs also to the second class, but by advantageous alterations differs materially from the above- named systems. The principles of the construction, &c., of the French gun remained a secret for the greater part even from the French officers, only those selected for this particular service, being instructed with details. After the capture of the first specimens, and their exhibition at several points in Germany, descriptions and sketches in explanation of the principles of construction, method of service, &c., appeared in the current journals; but as the French in deserting the guns had usually rendered them useless by destroying or carrying off some portions, these descriptions were frequently incomplete and faulty. In the following paper an endeavour is made to render plain all details. The complete gun is composed of the piece proper, the lafette or carriage, and the limber. Fig. 1. Plan of mitrailleuse from above. Fig. 1a. Sight, from behind and from the side. Fig. 3. View from the muzzle. Fig. 4. Section after a, b. The cartridge in plan and section. Fig. 5. Section c, d, and view of swing-bed from rear. Fig. 8a. Cartridge-magazine, plan from before. Fig. 8b. Cartridge-magazine, plan from rear. Fig. 8c. Cartridge-magazine, plan from side. Fig. 9a. Spring-box, plan from before. Fig. 9b. Spring-box, plan from rear. Fig. 9c. Spring-box, plan from side. Fig. 10. Needle and spring. Fig.11a. Needle-guide, plan from rear. Fig.11b. Needle-guide, plan from before. Fig.12. Rest-plate and crank, plan from above and from side [do not trust this diagram]. To facilitate description it may be divided into the barrels, A; the Jacket, B; the cartridge-magazine, C; and the firing mechanism, D.
This bundle of barrels is inclosed in a jacket, B, which has the outward form of an ordinary piece of artillery. (Figs. 1,2.) We may divide the jacket into the muzzle, the chase, and the trunk portion. The muzzle and chase contain the barrels, while the trunk serves as a receptacle for the cartridge-magazine, the firing-mechanism, and the screw. The jacket projects a little beyond the fall of the barrels ; the muzzle is sharply rounded, and in its upper half, in a triangular cut, is placed the forward-sight. The latter is not in the vertical plane of the axis of the piece, but a little to the right, [Fig 1 shows it offset to the right, but an actual gun, General Duchand in Paris, has the fore sight offset to the Left - see Gallery] and the distance to the right corresponds to the mean drift of the projectile and hence no allowance in sighting is necessary. At the point of union of muzzle and chase a ring is cast on the jacket. The chase has here its smallest diameter of 170mm, and extends to the rear, to the trunk part, in conical form, which in a length of 300mm (measured from the trunk) is flattened at the sides. A boss (b) and pivot is cast on the underneath side of the jacket which works in a socket in the swing-bed and allows a lateral movement. (Figs. 2, 5.) The swing-bed has trunnions for the vertical training. The pivot is fitted with a disk and bolt at its lower end to prevent dismounting in moving or working the piece rapidly. In the rear surface of the chase are four sockets, bored to admit the adjusting bolts of the cartridge-magazine. To the rear of the chase is the trunk portion, closed behind by the breech (c) open at the top and limited at the sides by two perpendicular walls which meet and form a rounded bottom. On the inner surface of the side walls are two grooves (d) which serve as guides for the firing-mechanism. On the upper edge an iron plate (e) is let in lengthways to preserve the metal from the friction of the backward and forward movement. In the bottom of the trunk there is a small hole to allow the escape of rain-water which may enter above. On the outside are two buttons each side, serving to fasten an apron for the protection against the influences of weather. The right side-wall has also a rectangular aperture for the introduction of the rest-plate screw. The breech (c) is bored through in its center and provided with a square thread for the screw, E. On the underneath surface of the breech is a cog-ratchet through the teeth of which passes the thread of an endless screw, connected with the swing-bed, thus affording a lateral movement to the piece about the axis of the pivot. This arrangement is not made for the purpose of giving the piece lateral training, but to produce the proper scattering effect. As the barrels are parallel the shot would otherwise be thrown in a very small area. At the highest point of the breech is placed the rear sight-mass (h) in which the rear-sight (i) is fitted hinge-fashion. The latter (Fig. 1a) consists of a foot-plate, two upright standards joined above, and the movable sight-bar. The rear surface of the standards is graduated to differences of 100 meters - for all distances from 600 meters to 1,300 meters. On the forward side of the left standard is a scale of centimeters and millimeters for a distance of 5 centimeters, and numbered, beginning at the lowest, 3, 4, &c., to 8. The sight-bar inclosing the standards is fitted with a spring, which permits of adjustment at the required elevation without the aid of a set-screw. The middle of the sight-bar is pierced for the sight-notch. The sight works on a hinge in the foot-plate, and, upright, admits the elevation of the piece for a distance of 1,300 meters ; thrown forward the elevation of the bottom-notch is for 500 meters. The length of the line of sight is 1,330mm. Besides this arrangement there is a reserve sight apparatus on the right side of the jacket. The fore-sight of the latter is placed on a block screwed into the flat portion of the chase. (K, Figs. 1, 3.) The rear-sight box is on the breech-rim and provided with a thread and screw for the sight-bar. These spare articles are carried in the limber-chest, to be used in the event of accident. This line of sight is 600mm in length. The cartridge-magazine (Fig. 8) is a square-shaped box, with rounded edges. It is of iron and provided with twenty-five perforations - corresponding with the barrels - to receive the cartridges. On the rear side these are slightly enlarged to allow the rim of the cartridge-case to sink to the level of the surface. Both front and rear faces are recessed around the several holes to prevent an escape of the powder-gases. The magazine is fitted with a hook (m) on each side to insure its juxtaposition with the firing-mechanism ; and to center its perforations with the barrels it is furnished with four brass-headed bolts (n) which fit neatly in the above-mentioned sockets in the jackets. A hand-grip is screwed into the top for adjusting it in its place, &c.
The cartridge-magazine is one of the most important of the independent parts of the gun, the united action of which renders possible the delivery of an extraordinary number of shots in a very short time. The service of the piece is much simplified by the simultaneous loading of all the barrels, and as a number of filled magazines are kept at hand a rapid succession of volleys is obtained, and with most destructive effect. By means of a contrivance fitted on the trail the empty magazines are cleaned and then immediately refilled. To facilitate charging, the, cartridges are so arranged in sheet iron cases that by drawing back a trap-plate the whole twenty-five fall together into their places in the magazine. The firing mechanism, D, consists of the spring-box, (Fig. 9,) with needles and springs, (Fig. 10 ;) the needle-guide, (Fig. 11 ;) the rest-plate and crank, (Fig. 12 ;) and the screw, E. The spring-box (Figs, 2, 6, 7, 9) is bored with twenty-five holes, which serve as guides to the needle-shafts enclosed in the spiral springs. The forward movement of the needles is limited by the plate (o) secured by four bolts to the spring-box. The rear surface of the spring-box is recessed to admit the flat head of the screw, E ; there is also an oblong aperture to receive a fork-shaped iron, (p,) the legs of which fit over the neck of the screw for the purpose of securing it to the mechanism. On the sides of the spring-box are two rectangular lands which fit into the grooves in the trunk sides. The top surface projects slightly over the edge of the side walls. For purposes of manipulation a hand-grip, like that on the cartridge-magazine, is screwed into the top plate. The spring-box is also pierced in a horizontal direction for the reception of the four guide-rods (x) which, being secured to the needle-guide, keep the two parts of the mechanism centered to each other. The needles (Fig. 10) are centered in the rear by the spring-cylinders, and forward by the needle-guides. 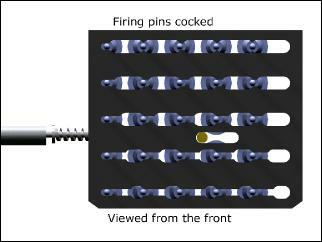 They are thrown forward by the springs, the points strike the cartridge-caps, and the cartridges are exploded. The four bolts, as guide-rods, serving to center the needle-guide and spring-box, are utilized to fasten the forward and after-plate of the needle-guide together. On the forward side of the needle-guide are found the corresponding hooks to those of the cartridge-magazine. The rest-plate (Fig. 12) serves the purpose, first, of holding the needles back, the springs under tension, and then, on receiving a horizontal movement, of releasing them to fly forward and explode the cartridges. It is cast with five slit-like apertures, so arranged that certain parts admit the passage of the rear, larger portion of the needles, while others only allow the entrance of the forward and smaller portion. The smaller openings are also so placed that, the rest-plate being in its extreme position to the right [if viewed from the front], they correspond exactly to the holes in the guide-plate and prevent an entrance of the needles. The length of the smaller holes is further so measured that the rows of needles do not move forward together, but successively, and beginning with the upper row. The needles in each row also start in a certain order of succession indicated in Fig. 12 by the small numbers. [Weygand [M 4] shows a different arrangement, and in more detail. Other sources [M 5], corroborate Weygand, so I maintain that Fig. 12 is inaccurate]. The reason for this arrangement in the construction is that the rapidity of fire being thus controlled, by the movement of the side crank, it is possible to impart a scattering effect by means of the breech-ratchet and endless-screw above mentioned. Further, if all the barrels were fired together the escaping powder-gases would seriously affect the accuracy of the fire. The gun-metal and mechanism is also relieved of much strain, as the vibration caused by the explosion of the powder-charges would be materially increased by the discharge of several contiguous barrels. As, however, alternate barrels are fired, and these in succession, the vibration caused by each has passed before the following begins. If, now, we turn the screw, E, to the left [anti-clockwise], the whole mechanism, including the cartridge-magazine, is drawn to the rear. The four guide-rods (x) strike against the forward side of the breech; and being firmly secured to the needle-guide plates, these latter remain fast, while the spring-box moves to the rear until it reaches the shoulder on the guide-rods, when the whole movement ceases. 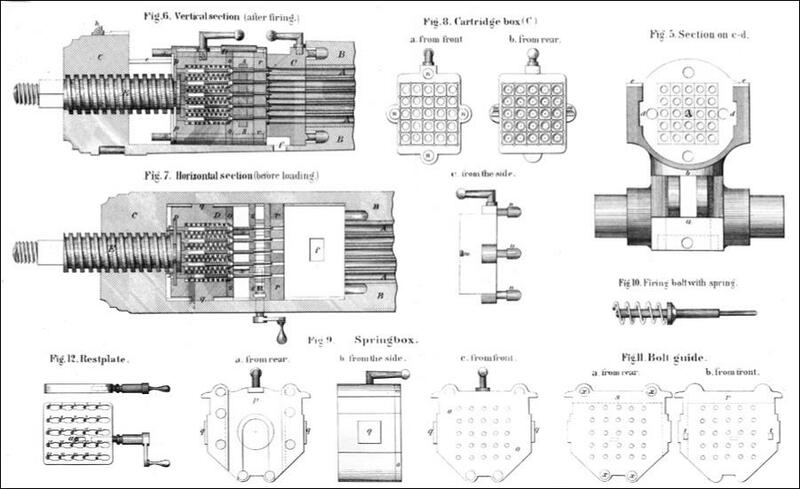 [This description does not match the drawings nor the mechanics of the mechanism. In practice, the spring-box is withdrawn by the breech screw E, until it hits the shoulders on the guide-rods, at which point, the needle-guide unit starts to be drawn to the rear, and with it withdraws the cartridge-magazine]. The cartridge-magazine is now lifted out by its hand-grip, and we have the apparatus as shown in Fig. 7. 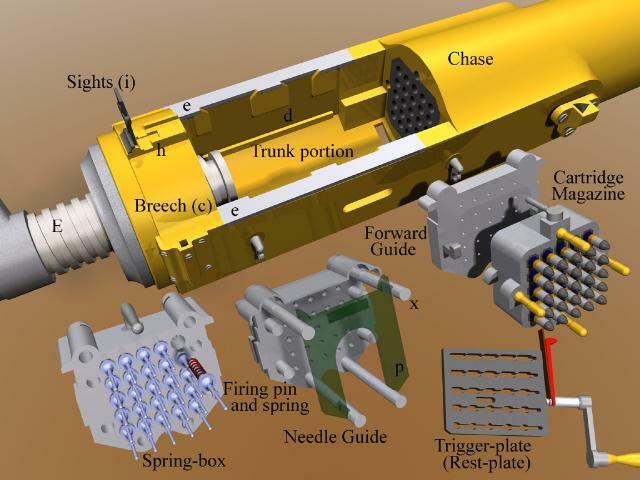 In separating the needle-guide plates and the spring-box the needles are drawn back so far that their larger portion is released from the broader hole of the rest-plate. The latter is now moved to the right, the needles enter the narrow portion, and the springs can be again pressed down. A filled cartridge magazine is now placed in position and hooked (m) into the needle-guide plate. The screw, E, is turned and at first only the spring-box moves forward, the shoulder of the rear part of the needle strikes the rest-plate, which, in its present position, does not admit of the former's passing. The springs are pressed down, and the needle-guide and cartridge-magazine move forward, the bolts enter their sockets, the shot their chambers in the barrels, and the forward fall of the magazine reaches the breech-surface of the barrels. The springs are only partially pressed down by this movement, and are only at complete tension when, on continuing to turn the screw E, the space between the needle-guide and spring-box is entirely closed. A brass apron (Fig. 2) is screwed on the upper part of the needle-guide in order to cover the joint between the latter and the spring-box. It serves as a protection against the influences of weather. The time occupied by the whole manoeuvre, with well-trained artillerists, is from 13 to 15, seconds, so that the piece is capable of delivering at least one hundred shots per minute. 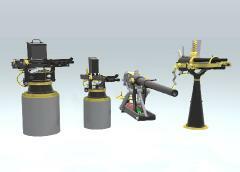 The cartridge used with the mitrailleuse is composed of the bullet, case, the charge, and cap containing fulminate. The bullet (a) is 3 calibers long, weighs 50 grammes, and is two-thirds of its length cylindrical in shape, with the other third conical ; the point is rounded. On the lower end are two grooves to insure a firmer union with the case (b.) The latter is made of cardboard, is cylindrical in shape, and provided with a brass cap (c) 13mm in height, with a projecting rim. The bullet is further secured in the case by a strip of paper (d ;) it is also armed on the bottom with a layer of tallow for lubricating the bore. The charge is six cylindrical-shaped grains of powder, each weighing 2 grammes. The uppermost powder-grain is separated from the tallow by a disk of paper. The lower part of the cartridge is closed by a paper cap, which is inclosed by the brass head containing also the copper capsule of fulminate. Both cylinder and paper cap are pierced with holes to allow the passage of the stream of fire from the fulminate. The whole cartridge is smeared with a coating of tallow. PLATE I. General plan from the side: A, limber; B, carriage. PLATE II. General plan from above: A, limber; B, carriage. The trail is in two parts, (a a,) called half-blocks, separated by forward, middle, and rear transoms, and held together by cross-bolts. It has a score underneath and forward for the axle. The short brackets (b b) are bolted on to the forward part of the half-blocks on each side, and are provided with scores above and below for the trunnion-plates and axles respectively. The wheels are wooden and measure 1,430mm in diameter, tire included ; they have fourteen spokes and seven felloes ; the hubs are bronze. The arrangement for training admits of movement in both horizontal and vertical planes. The swing-bed, (c,) of bronze, has a socket forward for the gun-pivot, also cylindrical trunnions (e') fitted with plates for securing them in the brackets. The swing-bed ends at the rear in the cheek-pieces, (e",) between which the flat head of the inner right-handed adjusting-screw (g) is bolted. (See also Plate IV, Fig. 5.) This screw works in the female thread of the left-handed outer screw, (g',) and this again in the screw-box, (h.) The latter rests with its rollers or trunnions in the bed, (i,) secured between the half-block of the trail. (See frontispiece.) Elevation or depression is given by turning the crank-wheel (f) on the outer screw. By using, in this manner, a right and a left-handed screw, working the one within the other, on raising the outer screw a double movement ensues and a more rapid elevation. This arrangement permits an elevation of 20° and a depression of 8°. The contrivance for giving lateral training consists of an endless screw placed in a score in the upper rear part of the swing-bed, and turned by the crank-wheel, (k.) The thread of this screw passes between the cog-teeth of a ratchet on the underneath side of the breech. This arrangement is to give lateral sweep during the firing, while lateral training is effected by moving the trail. The apparatus for cleaning the cartridge-magazines is placed on the rear part of the trail and consists of a foot-plate (l) with two sides, (l',) bolted firmly to the half-blocks, upon which are twenty-five upright iron pins and a lever for pressing down the magazine. 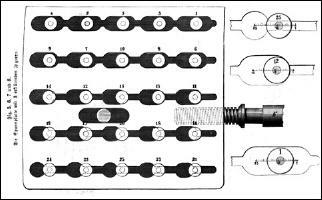 The operation of using it is as follows : the lever is raised and the magazine adjusted with the holes fair over the pins, the lever is pressed down and the remains of burnt cartridge, &c., driven through. 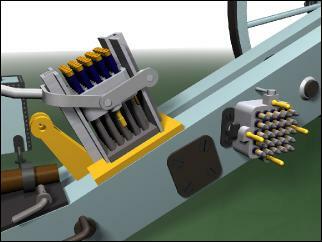 The axle-boxes (o o) are on each side of the piece secured to the axle by bolster-hooks. The corners are rounded and protected by sheet-iron. They are provided with hinged lids and serve to carry, each, two filled cartridge-magazines. The remaining iron parts of the carriage are the trunnion-plates (p) extending tapered to the front and rear to serve as bracket-guards ; 2 cap-squares, ( p' ;) 2 lock-plates, (q ; ) 2 hand-grips, (r,) to serve in limbering up ; 4 hooks, (s ;) 1 tail-plate with pintle-eye ; 1 handspike, loop and ring, (t) and (t ;) 1 loop, (v ;) shackle and bolt, (v',) for hatchet ; 1 hook, ( w,) for a bucket ; and 1 lock shoe-hook, (r ;) 1 side arm-hook, (/1,) for the lock -plate and chain. On the right side of the trail, above the lock-plate hook, is a small wooden box to carry one cartridge-magazine. The carriage is 1,430mm between the wheels. PARTS. - The axle, wheels, the limber-frame, the limber-box, and general iron work. The axle-arms are of the same size as those of the carriage, to allow shifting. The main part of the limber-axle is slightly weaker. The limber-box (m) rests on the frame and is secured thereto with bolts and iron hoops. It serves the purpose of carrying a certain quantity of ammunition, and also on the march a portion of the artillerymen. For these latter it is fitted with hand-grips (p) and foot-boards (n') on each side. The box is of wood and has a hinged cover, covered with sheet iron, which opens on the side toward the gun. The inside is divided into three compartments - those on the sides for ammunition, and that in the middle for spare articles, &c.